This is an excellent pumpkin seeds recipe that tastes absolutely wonderful. 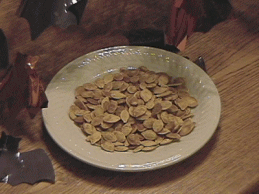 Ever wondered what to do with the thousands of pumpkin seeds after carving all those pumpkins? This pumpkin seeds recipes helps them become a crunchy, nutty snack. This recipe is a bit time consuming but is extremely easy. Save all the seeds after carving your pumpkins. Remove as much fiber as possible from the seeds. To remove the fiber, place in a bowl, fill with water. Pinch, or squeeze the seed and it will dislodge from the fiber. If you are unable to cook them right away, place them in a air tight container (a ziploc baggie will do) until they are ready to use. Place the pumpkin seeds in a saucepan. Cover with salted water. Bring to a boil. Turn down the heat and simmer for two hours, adding more water as necessary. Drain the seeds. Spread them on brown paper, paper towels, or parchment cooking paper to dry. Spread seeds on a cookie sheet or a flat pan. They will do better with a thin layer of seeds. If you have more, do another batch. Pour a small amount of cooking oil over them. Sprinkle them with either season salt or garlic salt. Stir to coat all the seeds with oil and salt. Don't coat to where it is solid salt. Just enough to see that they are salted. Roast, stirring occasionally, until seeds are a rich golden brown. This will probably take about one and half to two hours. Remove from oven, cool, and store in an airtight container.